Meet “Parker” (not his real name). He was born with hydrocephalus, a condition that involves excess water putting pressure on the brain and causing damage at birth. As a newborn, Parker required major brain surgery. At six months the neurologist said that Parker could only distinguish light. Six year old Parker, and his glasses. A pediatric ophthalmologist examined him around the same time, advising that Parker’s optic nerve was almost completely destroyed. The doctor informed Parker’s family that the infant would probably be totally blind, that at best he would grow to learn mobility with a cane and that he might be capable of learning Braille. Parker’s mother, a first-time mom, was very concerned. She refused to believe the doctors. She brought her son in and out of hospitals, seeing new doctors, undergoing MRIs and other tests. By the time Parker was 8 months old, his mother had heard about Dr. Ronald Siwoff through a friend who worked in the medical field. She was told that Dr. Siwoff specialized in treating infants and children with serious and difficult cases of low vision. She took the baby to Dr. Siwoff who conducted more tests and concluded that he was “sure” he could help. He told the family that he believed he could find a “window of vision” for Parker, and that he would design spectacles to expand that little window. Dr. Siwoff borrowed a VEP at that time. (Our practice now has 3 VEPs, constantly in use.) He designed customized prismatic spectacles for this little baby. The moment Parker had the glasses put on his face, he opened his eyes wide and began looking around. That moment was 5 years ago. 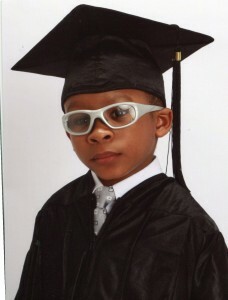 As you can see from the photo, Parker recently graduated from kindergarten. Parker is in a mainstream classroom. He can write his name. He recognizes and names shapes and colors. He sings songs and is in the church choir. He can navigate an iPad and play educational games. He can name the President of the United States and the Governor of New Jersey. After a terrible and traumatic start in life, Parker has the functional vision that doctors never believed he could have.